I was thoroughly tickled to find a product that, quite literally, combines my love of food and business…and is also a perfect complement to my appreciation of bizarre and corny humor. Enter MeatCards. 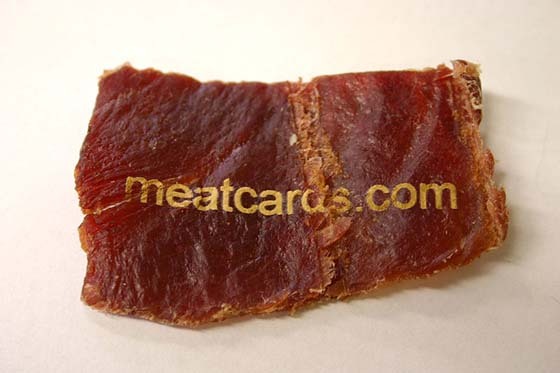 A group of fearless entrepreneurs have experimented – successfully, it seems – with laser printing onto beef jerky, to create edible, and highly original business cards made of meat. Going by their Twitter handles of @eagleapex and @tikaro, they share their prototyping process via photos on Flickr and offer information about purchasing their meaty wares by following them on Twitter (@MEATCARDS). Rather than spring for a predictable “first come, first serve” basis for creating business card prototypes for new clients, they awarded the customized samples via a most unusual competition: The first fifteen people who submitted photos accurately recreating scenes of man vs. dinosaur, based on Frank Frazetta’s stylized, pre-historic/fantasy paintings, were winners of the coveted meat cards. Take a bite out of business, have a good chuckle, and keep your eyes open at your next networking event. The local Big Cheese may be bringing some meat to the table.